My last day! : ( A sad one for me, this has been the absolute shortest week of my life. I am really wishing I had more time to stay on tour with Marcelo! This has been such a terrific experience for me that I can hardly explain it in mere words. We start the day at 800 hours by setting up the solar array to charge, of course. I am helping Mrs. Peton cook breakfast, so Marcelo recruits Bill and John to help with the task. Our new friend, Kathy has arranged the local TV station to come and interview us at 1000 hours. When I call to confirm the appointment, they will not commit to keeping it. We have contacted the local newspaper several times to ask for an interview, too. We are disappointed that neither news organization appears likely to come, we don’t understand why, it is very discouraging. Why don’t they want to report such positive news? I can understand more of what Marcelo has been facing all of these months and years with the solar car. While we are in Eugene, neither organization comes for an interview, despite multiple phone calls on my part. The newspaper does finally try to arrange an interview, but we are almost in Florence when we get that call! Right before we depart the Peton’s ranch, Marcelo recruits a new crew member! His name is Allen and he wants us to wait a few hours for him to join us. Marcelo contemplates this dilemma and then decides: “The batteries are full, the day is sunny and beautiful, and we are wasting sunlight with every minute we sit here and wait.” He tells Allen that he can take his time getting to Eugene, we will drive the solar car to Florence right now and Marcelo will come back in the van in a few hours to pick him up. I am secretly ecstatic, I really didn’t want to stay in Eugene, I wanted to go on the road immediately, too! I have definitely caught solar car fever; I do not want this day to end! It is pure joy for me! We depart for Florence just after noon, the drive is absolutely marvelous. The weather is beautiful, warm and sunny, a real halcyon winter day in Oregon! John wants to stop for coffee, but Marcelo, Bill and I know better and resist having some ourselves. John will lead us in his Range Rover, Marcelo will follow in the solar car and Bill and I will conclude the procession with the van and trailer. I am glad for the backup camera on the trailer; it comes in very handy today! Marcelo amazes me by averaging near 50 mph this trip, wow! Bill is in charge of photography once again. About half-way to Florence, Marcelo suggests that Bill ride in John’s vehicle, it will be much easier for them to speed ahead and get some videos than for me to do that with the van and trailer. He readily agrees and hops in with John. I find that I am completely alone for the first time of this tour and I am surprised at how much I like it! I am still connected with Marcelo by radio and also with John & Bill by a different radio. I am surprised at the real feeling of peace and calm that washes over me. I am feeling incredibly high, as well as confident and serene. It is such an absolutely gorgeous, sunny, warm, winter day! Marcelo is really enjoying the day, too and we have such a good radio connection that we are able to talk more often and easily. After such a long spell of cloudy and winter weather, we are both so happy to have sunshine and blue skies! After about 1 1/2 hours, we are very near Florence. Marcelo and John radio me simultaneously that they both need to stop for a restroom break and we stop and they race each other (I told you not to have that coffee, John!) Marcelo wins, but I think John may have let him? We proceed onward and arrive in Florence’s harbor about 1500 hours (3 P.M.) Guess what we do next? Pull into a nice sunny spot and charge the car’s batteries, of course! We are glad to see we have used less than � the batteries’ charge on the 52 mile trip! Marcelo is interviewed by the local newspaper reporter who obliges us by taking a great photo with my camera of John, Bill, Marcelo and I by the solar car, (Jack included!) I have really liked spending time with these three men, you are all so wonderful! It was a fabulous week for me; I wish it had not ended so soon. After the interview, we all had a late lunch and had the restaurant’s famous clam chowder. It was very tasty! John has a cousin who lives in Florence, and she has agreed to host Marcelo and Allen for the evening, hurray! John has been so helpful to us this week! We take the solar car and trailer to John’s cousin Antha’s house and get ready to depart from Florence. It is now time to say good-bye to Marcelo. It is very hard for me as I don’t know when I will see him next and consider him to be my brother. I am happy I don’t cry and can say good- bye with just an extra hug. We decide that the best way to go back is to go the way we came. It is almost dark and this way will be safer and quicker. Marcelo is going back to Eugene to get Allen and will follow us there. We start out about 1715 hours or so. I worry out loud about Marcelo’s van, so John reigns in his speed to keep him in sight. We arrive in Eugene and Marcelo signals us to pull over. He just wants to give us one of those Raspberry brownies I had given him at the beginning of the trip! I manage to get in one more hug and we all say a final good-bye to him. Good-bye and good luck, Marcelo! May the Sun God (Goddess?) continue to bless you! Another cloudless, but frosty morning, brought the charge up and Marcelo whipped his crew into action to get going; the sun rules. We crossed the Coast Range to Florence in good time. Things were looking up. We got word a member of the Corvallis EV group had volunteered to keep Marcelo going as Laurie, John and myself were heading home that evening. John again found Marcelo and solar car a place for the night with his Aunt. This was an adventure; not knowing where we were ending up each night. Marcelo, with his unflappable determination and Forest Gumplike optimism; you can see how he has this, single handed, the equivalent of practically halfway around the world, on some difficult roads. Its quite an accomplishment. One of my treats was getting ahead and videoing the car, passing by at fifty miles an hour, silently; the solar panels reflecting the sky. Go Marcelo! 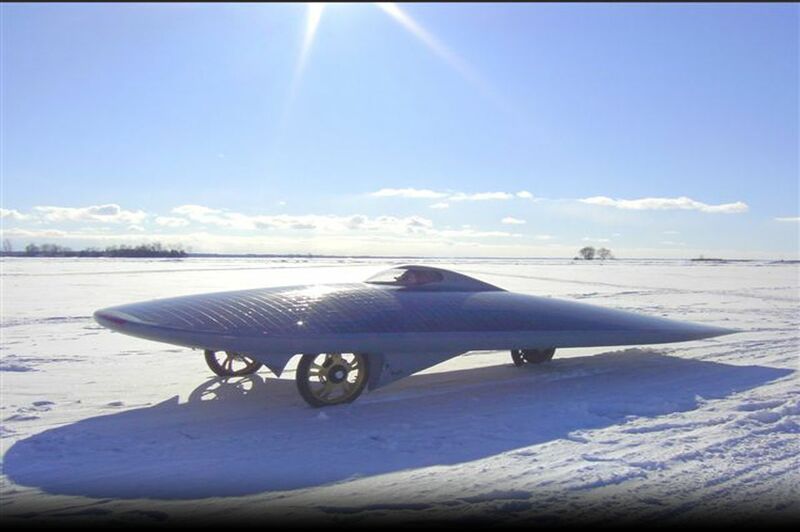 Hey, did I see a solar car? Jack ansie to get back on the road! First solar car to herd sheep. Really! XOF1 and the "A team" van exiting a tunel powered with bottled sun juice. "blocked right, blocked left, clear,...whatch out for that tree!" As the solar car arrive in Florence people gathered arround it. John, Marcelo, Laurie, Bill and Jack standing on hind legs. While the sun feed the batteries we got ont the way to feed our bellies. A constant flow of people comming to check out the solar car.